The zenith is the direction pointing directly above a particular location (perpendicular, orthogonal). Since the concept of being above is itself somewhat vague, scientists define the zenith in more rigorous terms. 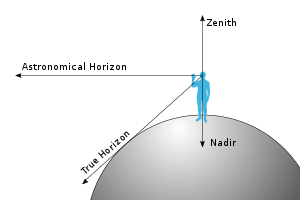 Specifically, in astronomy, geophysics and related sciences (e.g., meteorology), the zenith at a given point is the local vertical direction pointing away from the direction of the force of gravity at that location.Zenith is also used for the highest point reached by a celestial body during its apparent orbit around a given point of observation. Often used in this sense about the Sun, it only corresponds to the first concept of zenith for one latitude at a time, and never at all for latitudes outside the tropics. The nadir is the direction pointing directly below a particular location (perpendicular, orthogonal). Since the concept of being below is itself somewhat vague, scientists define the nadir in more rigorous terms. Specifically, in astronomy, geophysics and related sciences (e.g., meteorology), the nadir at a given point is the local vertical direction pointing in the direction of the force of gravity at that location. The direction opposite of the nadir is the zenith. Nadir also refers to a downward-facing viewing angle of an orbiting satellite such as is employed during remote sensing of the atmosphere, as well as when an astronaut faces the Earth while performing an EVA. The word is also used figuratively to mean the lowest point of a person’s spirits.